Investors pulled $5.6 billion from stock funds in the first quarter while pouring $94.2 billion into fixed-income funds, according to Bank of America. The S&P is up nearly 13 percent so far this year, on pace for its best quarterly performance since the third quarter of 2009 and best start to a year since 1998. This quarter is one for the Wall Street history books — stocks are on track to post their best quarter since 2009 and best start to a year in more than two decades. However, investors shrugged it off. While the S&P is up nearly 13 percent so far this year, on pace for its best quarterly performance since the third quarter of 2009 and best start to a year since 1998, stock funds failed to attract new money. In fact, investors pulled $5.6 billion from stock funds in the first quarter while pouring $94.2 billion into fixed-income funds, according to Bank of America. 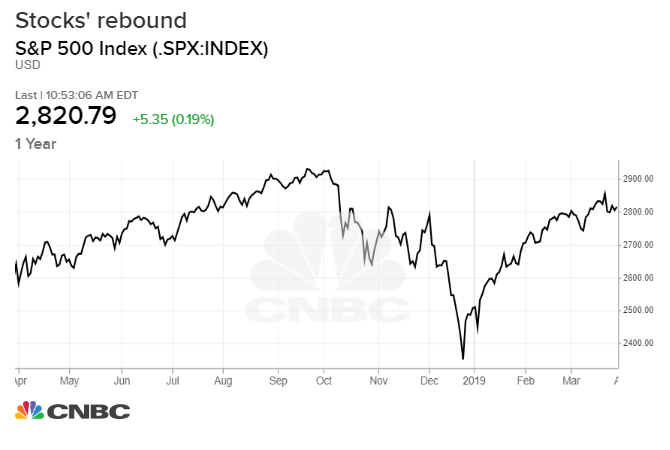 The stock market's stellar performance this year came after a brutal end of 2018. Investors who suffered the worst December since the Great Depression seemed still reluctant to throw themselves back in even though stocks have fully made back the steep losses. Recession fears have been reignited recently, as weak economic data roll on and the bond market is flashing the biggest recession signals since before the financial crisis, driving investors away from risky bets. "Looking forward, there's been material progress in alleviating the earnings growth and Fed worries that caused the Q4 2018 correction," Tom Essaye, founder of Sevens Report Research, said in a note on Friday. "But it would be a mistake to think these issues are resolved. So, we remain cautious on risk assets as we look for more proof of stabilization." Nicholas Colas, co-founder of DataTrek Research, said investors shouldn't buy the comeback, calling this year's rally "a January effect on steroids." While shunning equity funds, investors are warming to the corporate bond market. The amount of investor money flowing into high-grade bond funds is now on pace break a new monthly record. The move is seen as a hedge to the Federal Reserve's about face on interest rates last week, saying it would pause rate hikes. Corporate bond yields are generally higher than U.S. Treasuries. Investors have also been piling up cash as volatility increases and global uncertainties mount. According to a recent Charles Schwab survey, 44 percent of the active traders on its platform have increased the cash portion of their portfolios in the past three months.